There are a lot of these: 500+ pictures, of over 1000 cows. I’ve grouped many of them but have left a few as individuals either because they’re special, or to demonstrate ‘class’ characteristics; or just because they got left out of the group photo or were purchased after it was taken. 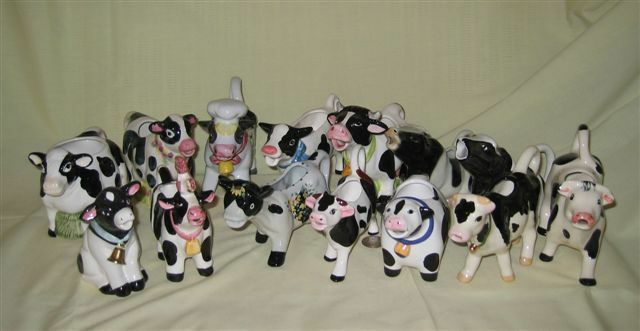 I’ve also tried to order them a bit, starting by color – white, black and white, brown, purple, blue – and then by other features, ending up with some interesting ones from around the world, and finishing with the few creamers (and sugars) made as part of ‘Cow Parade’. You’ll also note that while most of these are 20th century (and a few from the 21st century), there a few scattered older ones that didn’t seem to fit well elsewhere. As a reminder, click on any thumbnail to see a larger picture. Let’s start with a repeat showing of the ones that started it all – my first cow, and my dad’s; and per Bessie and her calves, what happens when you put a bunch of these animals together. 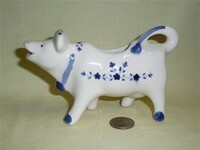 My father’s little blue creamer is German porcelain with a Delft design, and dates from @ the 1910s. 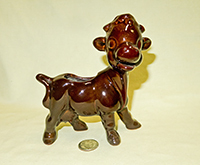 Bessie comes from the late ‘40s or early 50’s, and has been identified by sellers variously as “made by American Pottery for Disney by Shaw”, or as one of the animal figurines of Robert Simmons of California. I favor the latter interpretation. Here are the two single-hole creamers that were also featured in "My Story" - wood fired pottery by Ingrid Barnes. 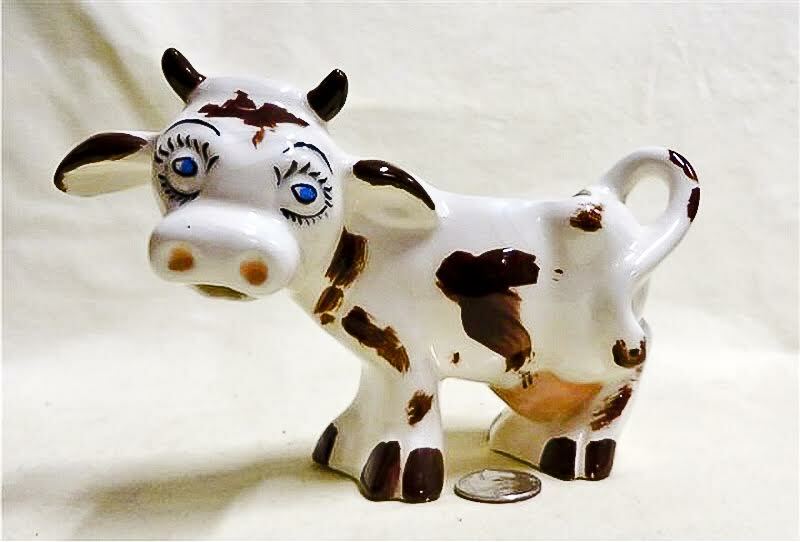 Her husband and I were college classmates and fraternity brothers way back when, and I had been pestering Ingrid for decades to make me a cow creamer. She finally came through (after I made her a Nantucket Lightship berry basket, nothing like a bribe for motivation). I find the coloration on these fascinating. Except for the blue spots and edging, Ingrid assures me it's a 'gift of the kiln gods', attributable solely to the wood firing process. 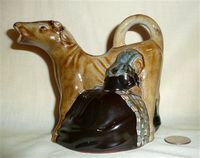 This extremely interesting creamer, a hunter in a cow suit, deserves to be up front in pride of place, if for no other reasons than its uniqueness and the quality of the workmanship. It is German porcelain, likely early 20c, and I’d guess almost certainly from near Rudolstadt, a town in the German Bundesland of Thuringia, close to the Thuringian Forest to the southwest, and to Jena and Weimar to the north, and the locale of many porcelain factories. 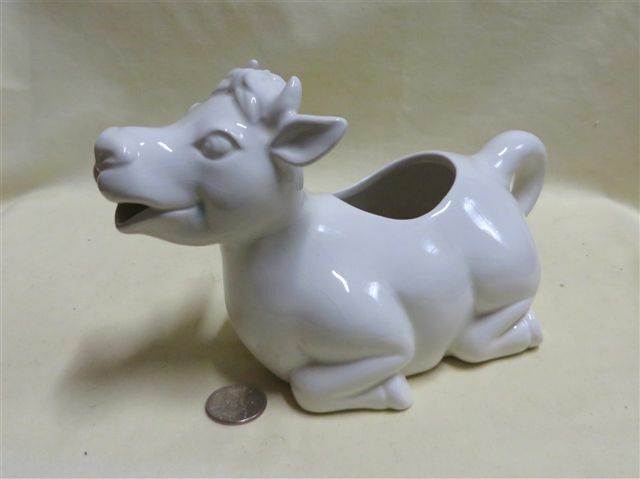 This is the town of the Schafer & Vater Porcelain factory – see Favorite Brands for my collection of their marvelous animal creamers – and their success seemingly inspired many other porcelain factories in the area to create similar whimsical items (or vice-versa?). While I would like to believe that this is “S&V”, I sincerely doubt that it is one of theirs based on the paint and material, but it is certainly characteristic of the area (as is a chicken that I bought thinking mistakenly it might be S&V). 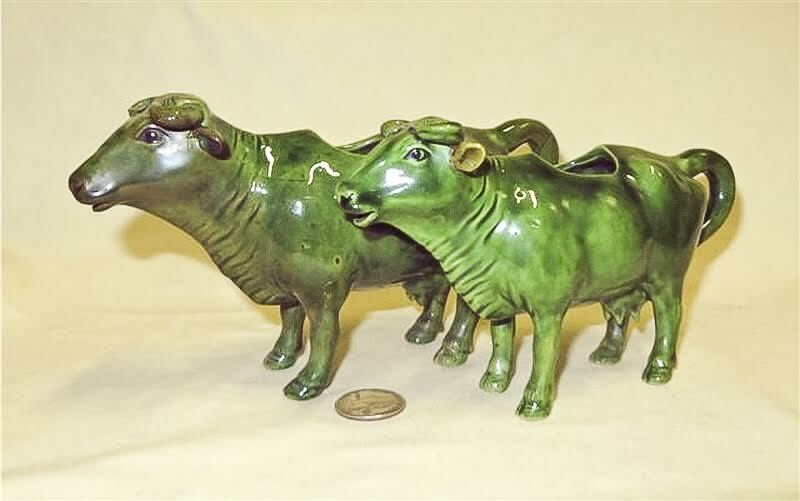 These beautiful, hand-molded green cows are a mystery to me. The smaller one arrived from Canada, and the larger (which is missing her right ear) was part of a fine small collection of a lady from New Jersey. 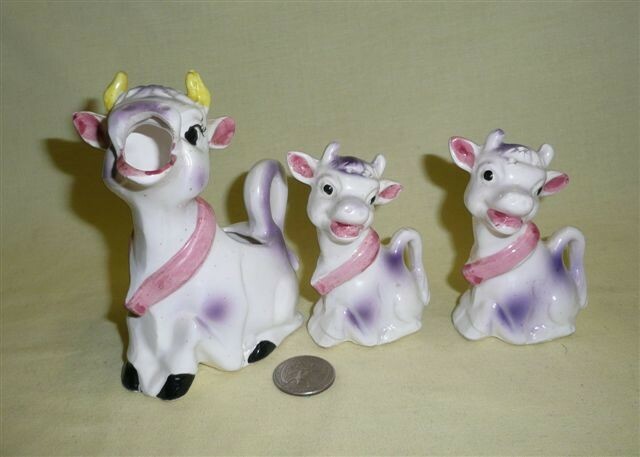 They are very well made and although they have their horns curled against their foreheads like some of the Victorian era Staffordshire creamers, I would guess that they are American or Canadian, and very likely late 19c. They’re sufficiently different and interesting that I felt they should be highlighted up near the front of this part of the collection, and I would be delighted if someone could shed more light on their origin and provenance. This creamer is also sufficiently unusual that it deserves a bit of up-front attention – all glass, quite delicate, and accompanied by a glass spoon that may or may not have originally come with it. Thankfully the English lady who sold it to me packed very well. To put at least a modicum of order into the large number of creamers in this category, let’s sort some of them by color - starting with white, if for no other reason than that seemed to be the favorite for ‘new’ cow creamers being offered at the end of the 20c and the start of the 21c (by 2012 or so, plain colors started to be more in style though white is still popular). 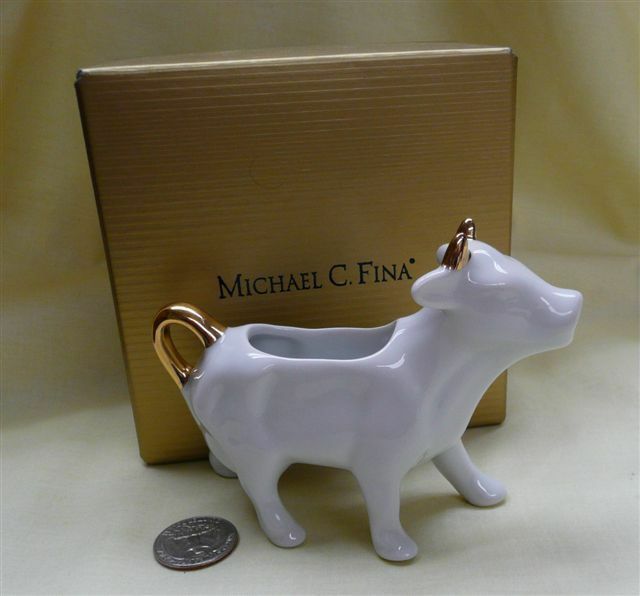 I have learned that Chuck Williams, who founded Williams-Sonoma in 1956 and was known as an innovator, takes credit for having started the white cow-creamer ‘fad’ in the US. To quote a 2004 article about him in USA Today, “Williams recalls the 1960s trip to France when he spied the whimsical piece — only it was covered with colored pieces and featured the city's crest on the cow's flank….’I said to someone that if I could only just get it in white, I could probably sell it in the United States,’ he says. ‘Well, they said that was impossible; they were only made as local souvenirs. …Well, I got them in white. We sold thousands right away.’ " –Here’s another quote, from a tag on a white cow creamer found in a Williams-Sonoma store in 2015: "Chuck's Find: William-Sonoma founder Chuck Williams first spotted this whimsical creamer at Apilco's Paris showroom in 1960. 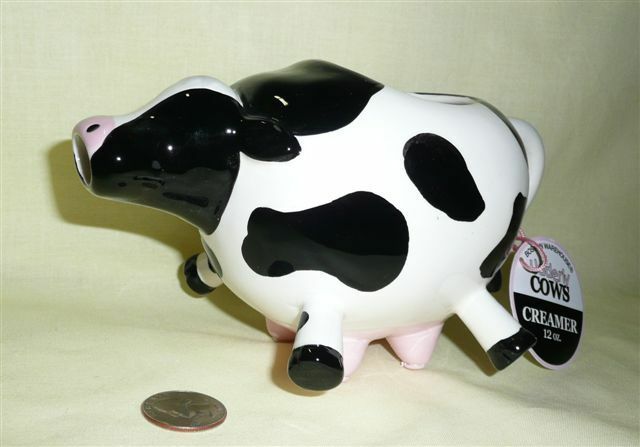 Chuck fell for the simple yet charming cow shape, and it became one of the first pieces of Apilco French porcelain that William-Sonoma ever carried." So, here on the left is an Aplico creamer (marked for them), on the right a recent one marked for Williams-Sonoma. Well, it turns out Chuck isn’t a complete white purist, because here’s a Williams-Sonoma marked creamer with flowers. Nor it seems was Chuck terribly worried about exclusivity, because here is a pair from Pier 1 from the identical mold (and likely the same manufacturer) as the W-S one pictured above. Chuck Williams was certainly right however about the popularity of white cow creamers…almost every kitchen shop and department store sells some version of the ‘plain white’ cow creamer. They come in a rather amazing variety of sizes and shapes, and most of the ‘big name’ cooking schools and kitchen suppliers, e.g. Cordon Bleu, have one or more versions. So do many important porcelain manufacturing companies, e.g. Limoges. This plain and simple (but subtly different) version is marked for Better Homes and Gardens. 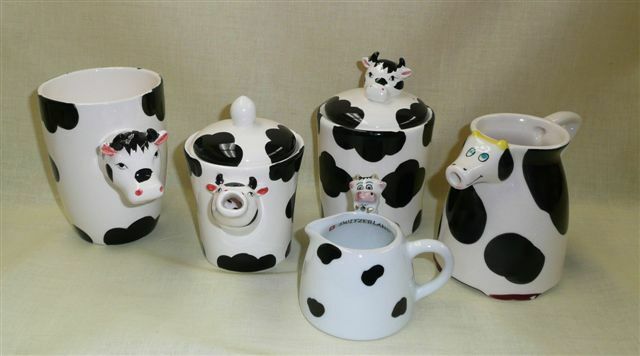 Here are some examples of rather ‘fine’ pure white cow creamers – one of the two on the outside is marked in green for Gerold Porzellan, Bavaria, Made in Western Germany (their post-1949 mark), and has a black and gold crown sticker on its side from “E&R” (for Ebeling and Reuss ) and Western Germany (meaning after E and W Germany separated in 1949). It also has “Germany” and the item number “1498” impressed on the lower right side of the belly, as does its mate which is otherwise without any marks. There is a very fine web site, produced by JoAnn Snow who collects Gerold Porzellan, that gives a lot of information about this company which operated in Tettau, Bavaria, under various names from 1937 – 1997. 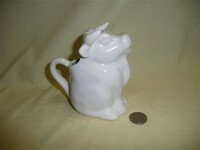 See www.gerold-porzellan.com; it contains a shot of one of these creamers under kitchenware. 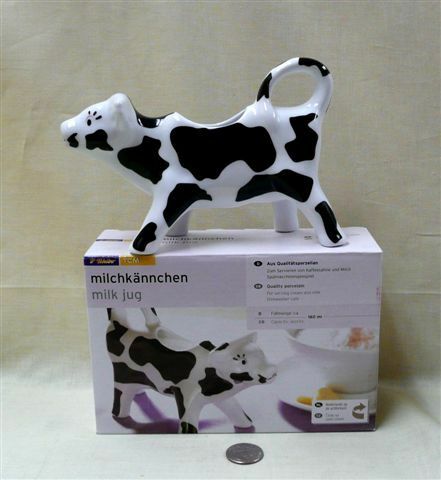 Many of my other German cow creamers bear a similar impression of Germany and an item number but are otherwise unmarked; it may be that they are also from this company. 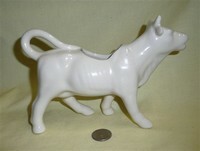 The creamer with the cover in this picture is marked “White Magic, 2092A, Holland”, and also has a joined script J and P. Goebel’s pure white cows, of similar quality, were shown in the Favorite Brands Theme. The one on the left here, with the dots for eyes, is another of the ‘boys’, from Taiwan. The one in the middle with big eyelashes is a French lady, sporting on her belly a green fleur de lis with “Veritable Porcelaine de grand feu”. The heavy little seated one is stamped “WCL”, and is here because it’s an example of a white one that wasn’t always that way. The little black specks indicate that at one time it had black ‘cold paint’ spots applied over the glaze, that have since washed off. I have a couple others like that. 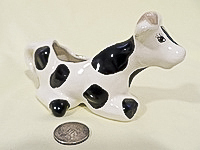 The rather stout cow with legs in an awkward position is marked “The Cellar Whiteware, Made in China Exclusively for Macy’s”, which is where I bought it on sale for $5.99…their current version of the ‘plain white cow creamer’. Neither of the other two are marked, but the cream colored one facing to the right bears a striking resemblance to some of my Czechoslovakian and Austrian cows. It’s not unusual to find that a factory will produce plain white glazed versions of their otherwise colored wares. The only strange thing about the little gal on the right is that she has only three teats. Here on the left is another example of a plain white version of a creamer that also comes in a variety of colors – although unmarked, it’s mold 5540 from Coventry and there are several others in a variety of colors on these pages. The middle one is bisque, i.e. biscuit fired, ready for paint and glaze. There’s a version in black and white with its sugar mate on the sugars and creamers page. I believe these come from one of those ‘do it yourself’ pottery craft stores. 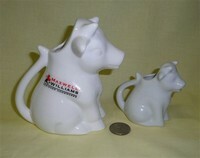 The one on the right is marked “Studio Nova, www.studionova.com, KT513 Farm Cow, Fine Porcelain, China”. Two more from different countries – the French ‘lait’ cow with the very awkwardly stretched out front leg is marked for Porcelaine du Berry…obviously the ‘porcelaine’ slumped a bit in the kiln. 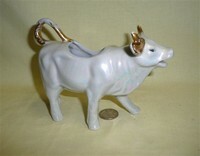 The cream luster cow with gold on the tail and horns is also porcelain, and I believe early 20c German. Another French cow, this one nicely modeled with a very large tail loop, It’s one of the largest of my many white cows, ~ 10 ¼” long. This unmarked one with wide legs and large jowls came to me from the UK – seems there’s always another plain white cow creamer from a different mold. The little square creamer on the box was made in Barcelona, Spain – but I bought it from a company in England that mailed it from Germany. So I guess you could say it’s a European mongrel. 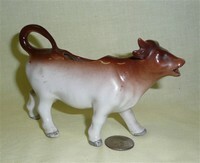 The small striding cow came from The Country Cupboard in Fairford, Gloucestershire England; and the little forlorn one with the cold paint black eyes and gold bell is of unknown provenance, but from the nature of the paint is likely Japanese and has some age to it. 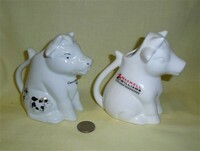 Here are a couple international white cow creamers with interesting stories. 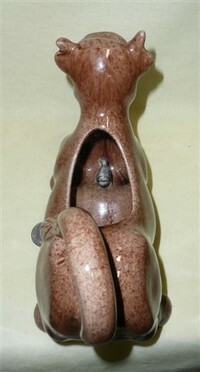 The little roundish hornless lady with the big handle is marked for SOFAL, Sociedade do Faiancas SA, Portugal. It also has a logo of wine glasses which might indeed be what this cow is intended to dispense, given the Portuguese proclivity for imbibing good wine. They’re located in Alcobaca…and playing around on the web, I found that in 1999 they were funded by the EU’s Fifth Framework Programme for an exploratory research and development award “to develop a polymer coating and decoration system for high quality ceramics. This will eliminate the need for multiple, high temperature firings and will enhance the variety and quality of decorative effects dramatically.” Heavens knows whether my cow received such a coating – but I do like the very unique design. 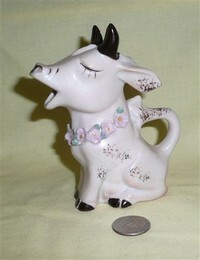 The kneeling cow with the big smile came to me from the UK and is stamped for Laura Ashley. Corporately, Laura is a fashion and home furnishings company owned by Computershare Investor Services plc in Bristol. Their UK web site (there is also a North American one) has a page that tells all about their history, which begins “Laura and Bernard Ashley started printing fabric on their kitchen table in 1953, following a Women’s Institute Exhibition at the Victoria and Albert museum on traditional handicrafts…” and it goes on at length from there. So yes, Virginia, there indeed was a Laura Ashley, sort of the Martha Stewart of her day, though over time like with so many other successful ventures, there have been a number of corporate shifts. This is one of the weirder caricatures I’ve seen. It has a couple raised places near the bottom, so presumably there’s a colored version around somewhere. The UK seller couldn’t tell me who made it, but she did recount that it came from the estate of Merlewood House in Torquay where it was a kitchen item in the part of the house that was used as a B&B. So, presumably it has been seen and used by quite a few folks. 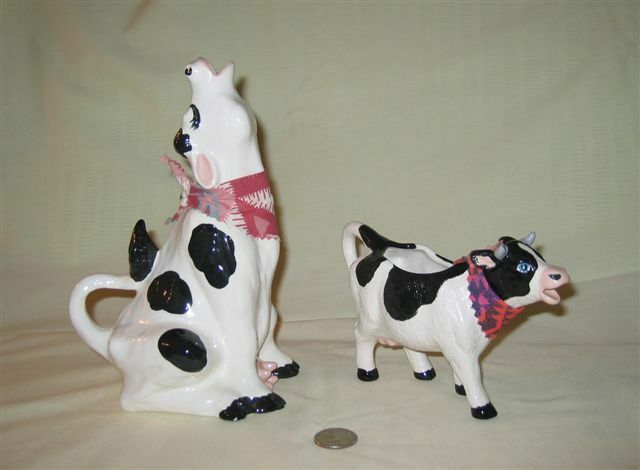 These two well formed porcelain cows migrated to Scotland from Germany. 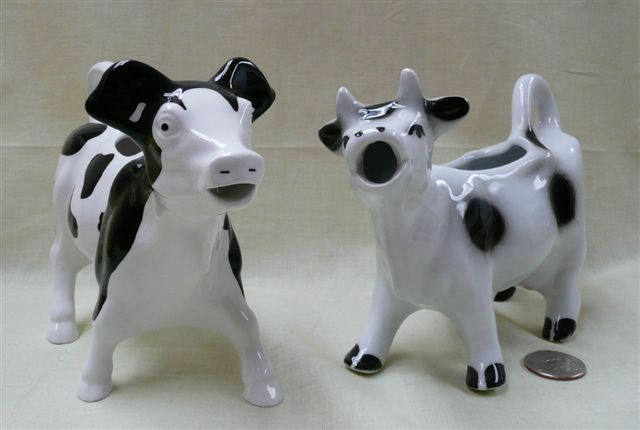 The one in back, with the very faded wording “Straucht frae the coo”, is from the same mold as the two brown creamers with lids further down this page. It’s also quite popular to embellish the ‘standard’ white kitchen creamer with flowers or other decorations. Like the plain ones, these come from a number of kitchen and cooking equipment purveyors, e.g. the one on the far left with the little pink flowers is from Pillivuyt of France, and the one with the orange poppy is from “Williams Sonoma Grand Cuisine”, also of France. 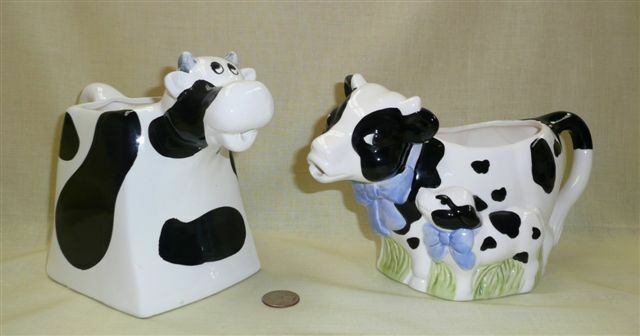 In the other photo, the heavy legged creamer with large blue flowers and the black tail tip is from STA in Cuernavaca, Mexico; a couple sets from the same mold and maker are discussed in the ‘creamer and sugars’ theme. The one with butterflies and the raised lip on the back opening is from Limoges, France, while the other two are both from BIA Cordon Bleu, a wholesale company in California that was established in 1952. These two are both apparently from the same mold, but are marked slightly differently – the one in the middle says BIA Cordon Bleu International, Custom Made in China, while the one on the far right is marked for BIA Cordon Bleu Porcelaine & Chine, The Freida Collection, and Hand Decorated in the US. Apparently different retail outlets for the same wholesale product. More white cows with flower decorations – the one with the bird is French, a gift from friends; the one with butterflies and the brilliant floral display on legs and haunch is German - © C. Pabst of Paperproducts Design GmbH, Am Hambuch, Meckenheim; and the two on the right with flower-like patterns all over are from Nordstrom’s – they sell cow creamers from this mold in a variety of patterns – and very likely made in China. 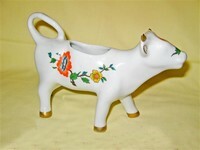 This happy cow with dainty yellow flowers – actually a satire of a creamer because it has no mouth hole – comes from the firm of John Beswick and family. She and her relatives with flowers of different colors are on the Favorite Brands page, but this one came along later and I thought it deserved a place here as well. 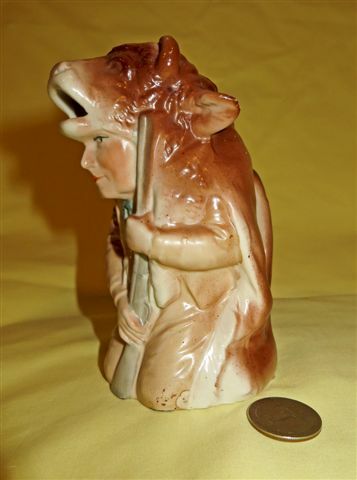 The Beswick firm was established in 1892 and was noted for high quality figurines, over the years including dogs, cats, farm and wild animals, and later Beatrix Potter and then Disney characters. 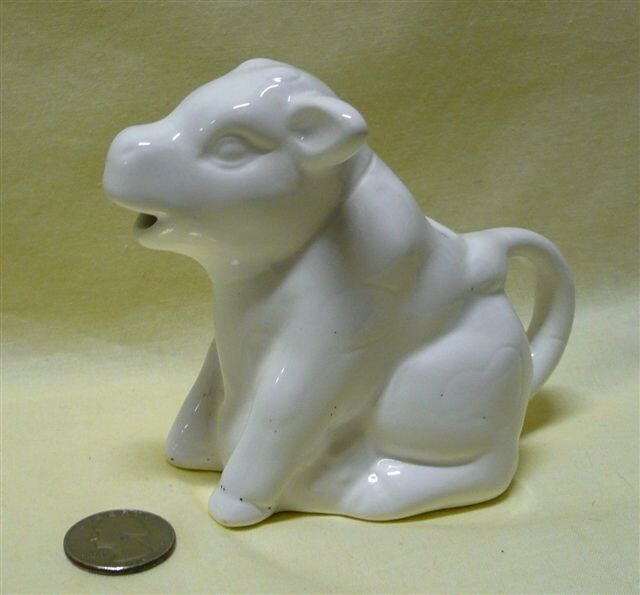 In 1969 Beswick was sold to Royal Doulton which continued to produce Beswick products until 2002, but with their own backstamp starting in 1989. 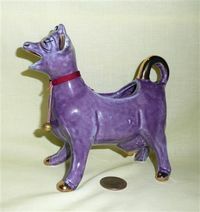 In 2004 the Beswick name and design rights were sold off to Dartington Crystal, which continues to produce some figurines as well as vases under the Beswick name. 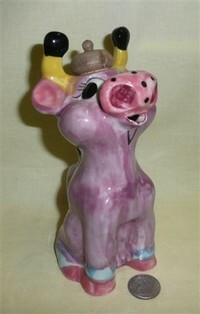 This cow, ‘Daisy the Cow Creamer’, model 2792, was made under head designer Graham Tongue during the Doulton era. It was produced from 1983 to1989, and thus bears the Beswick name. 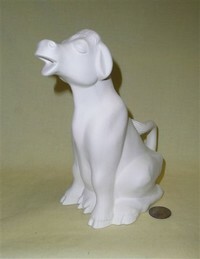 The Beswick 2014 Price Guide by Harvey May gives its value as $85-140. Why ‘Daisy’ when the little flowers look more like roses is beyond me – but then this was part of the ‘Farmyard Humor’ collection so perhaps that, as well as the lack of a mouth hole, was intended to be part of the humor. 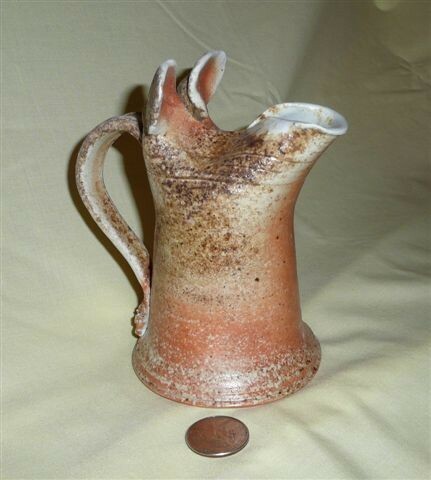 Here is an unusual, very large, thick, heavy plain white creamer – unmarked. Its companion, another ‘embellished’ version of the standard white creamer, has a bright red flower on the side you can’t see, and is marked “Made in France” in green, and “FLORENCE – Made in France” in gold…guess the maker wanted to make sure you knew it was made in France…just in case you couldn’t figure out what “Lait” was. This green and white creamer is an interpretation by Eve Taylor, or so it says on its side. I have been unable to locate any information about her. This is a rather fascinating older creamer, that I acquired after being asked about it by someone who had looked for assistance on this web page. The basic shape is fairly common, but it’s made of a very dense ceramic with a black thin base layer, and is filled both below and in the circle usually made by the tail. I’m afraid I was able to offer the UK seller no real assistance, other than rescuing it from a boot sale. Some white creamers also come adorned with delicate raised flowers. 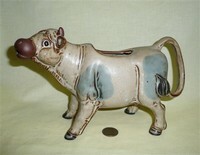 The kneeling cow with the handle is from N. Sorrento by Arnart. The wonderful gotheborg web site’s page on Japanese marks notes that “Arnart Imports Inc. [which was started in 1952] is still in operation and is currently located in 230 Fifth Avenue, New York. 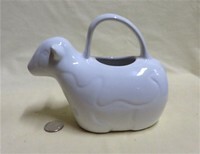 The company specializes in Porcelain gifts and decorative accessories. First registrated trade mark is the Crown and A's mark registered April 30, 1953. A mark looking like a bee hive (which adorns this creamer), was first used the last of December 1957. Both were cancelled in 2001”. 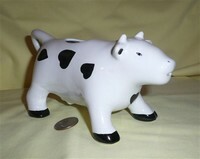 The small matte-white cow with the gold bell is simply stamped “L-434” and has a blue and white oval sticker for Made in Japan. 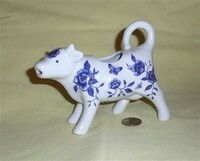 The flowers on this kneeling cow aren’t raised, but the creamer is nicely detailed. It has “Italy” written on the bottom. 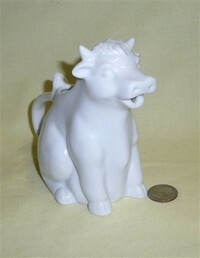 Little white sitting up cow creamers are very popular, and not just in the US. 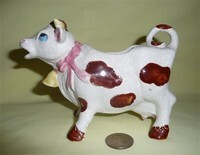 The one with little cows around the bottom Says “Grevilla Wines, Bega” on its chest, and it marked for Damsel Products of Australia on the bottom. Leave it to the Aussies to pour wine from a cow (or a boot, or …). Its neighbor bears a sticker from Maxwell & Williams Designer Homewares, an Australian owned company that started in 1995. In the middle picture, this creamer is sitting next to a smaller cousin, in this case one made by Dansk. In the third shot, the Dansk creamer is surrounded by one from Spain on its right (seen also in the Pitchers section with its larger partners), and one from the UK on its left. These little guys, made by a number of manufacturers, are widely sold in coffee and homewares shops, in some cases by the boxful just in case you might like to set one out for each of your guests. Finally for the ‘white’ section, here’s a new little one with gold trimming that says on its belly, “Moo-LA-LA, Michael C. Fina”. This company started by selling silverware in Manhattan in 1935, and is still owned and operated by the Fina family. Today it also sells jewelry, dinnerware, houseware, and giftware. They have a nice web page. Black and white is, if anything, even more popular than pure white; and many of these creamers also have a bit of pink or some additional accoutrements, ranging here from flowers and bells, to a rooster and a chef’s hat (that one also has a chef’s hat sugar bowl, that I didn’t bother to picture). There are of course ‘transition’ colored creamers, i.e. available as either white or black and white, generally of the modern inexpensive sort that are widely available in kitchen stores. Here are three examples, all from essentially the same mold. The black and while ones (also available as plain white) are marked “Porcelain exclusively for Pier 1 Imports, China”, and cost $5. The white one is stamped “Williams-Sonoma Marketplace” and sold (a year earlier) for $6.99. The puzzles here are how Pier 1 can claim exclusivity for something being purveyed by one of its competitors, and why Williams- Sonoma thinks their name is worth $1.99 more than Pier 1’s for the same item…admittedly, only a collector like me would be suckered into buying both. 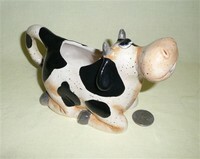 This little black and white guy is embellished with a deep purple udder. Pretty obvious where she came from – on the back of the package there is a short description of porcelain (‘a hard, fine-grained nonporous white ceramic material that is extremely durable’) and the logo for the manufactured, RPI or Resourceful Products, Inc, of Belmor NJ…although not surprisingly, it was Made in China. Fair enough I guess, since that’s where porcelain was first developed. Here are two ‘pairs’ that look similar, and may in fact be from similar molds, but at least are from different manufacturers. The one on the left has a blurry stamp that says something like ‘Obrarte’, and an impressed number 630; its match on the right is unmarked. Similarly, the squarish one with brown shading is clearly impressed for ©GIFTCO, while its companion has nothing to say for itself. This is actually a bit of an odd assortment. The three on the back and left came together – they’re a cup, a sugar, and – from the fact that there is a strainer inside – apparently a small teapot instead of a creamer (unless the strainer is intended to restrain flies, curds, or some such). The one on the right with the long snout is named “Funky Dabarpact’; he was ‘designed exclusively for Debenhams’, the UK Department store, and was made in Thailand. 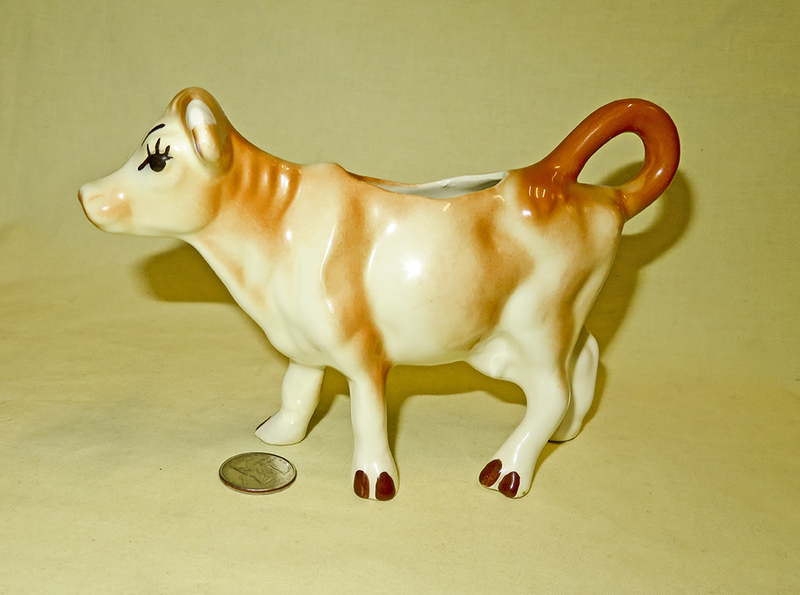 The little pitcher in front, with the tiny cow hanging on to the rim and the Swiss flag and label, is marked “Creation melpa Bulle”. We bought it in Geneva. Three variations on the ‘bulbous-nosed round cow’ theme. The one on the left is unmarked, but “Dookie” in the middle has an impressed ©SM. Dookie is very popular with kids in Europe, and even has his own web site (in French). The cow on the right is copyrighted for TIC. Yet more black and white, including some with bases, and one toward the middle that’s lost most of its cold paint and now sort of looks white but for the eyes. Three quite different black and white creamers – the only one with any marks is the small sitting-up one in the middle. It is stamped for “Frutuoso, Made in Portugal”. I have an identical one marked for “Reducta, London”, as well as a couple very similar plain white ones, so this must be from a very common mold. The creamer with the trapezoidal base was made in Taiwan but has no manufacturer’s name. The one with the blue bow and calf is “A Teleflora Gift”, ©Teleflora. I don’t know anything about that company, but a quick eBay search shows that >250 items of theirs are up for auction; and I did locate a Taiwanese ceramic manufacturer and exporter, Thai Pattana Ceramics, that shows Teleflora as one of the companies they serve. I debated about whether to put this unmarked bluebird-bearing black and white cow here or in the watering can page, but she’s only about 4” tall and wouldn’t be very functional unless you wanted to water only one small plant at a time. So I guess someone was just being whimsical – it’s my only ‘cream sprinkler’. Cow-yote? Whatever, these two both come from Desert Doodads. There’s an incomplete yellow pages listing for a company by that name in Tuscon, AZ, but no further information on the web. The only one of these four that I have any information about is the large one facing sideways. She is prominently stamped with a crown over the words ‘Staffordshire Fine Ceramics’ in a circle, with ‘England’ in the middle and ‘Hand Painted’ below. Given the number of potteries in Staffordshire, that still leaves me guessing. The cow with the pink ribbon, yellow bell and small yellow horns is interesting because of the fly on its rump. 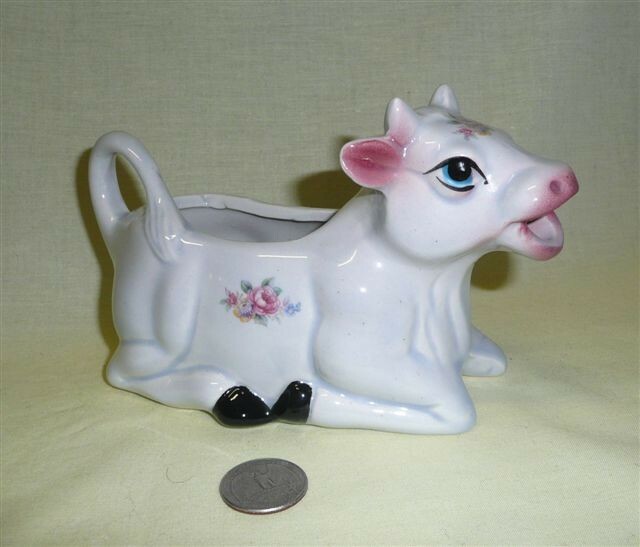 Many of my silver cows have the traditional fly on the lid, but this is the only modern ceramic one I have seen so decorated. The diamond mark on the belly is illegible so I have no idea when or where it may have been crafted. The little one with a light green collar and grass fill below is unmarked, but the larger one with the crest is quite obviously from the medieval Swiss town of Gruyeres, famous for its cheese and voted the most beautiful village in western Switzerland in 2014. Three more unmarked little black and white cows that don’t have much to say for themselves. The pudgy one with black head and back and stubby legs was a birthday present from my son – a duplicate though he wasn’t aware of that because my first one was still in its box. The box does have some information: ‘ Made in China for MCS Highland Park IL, A bunch of web searches indicates that the MCS (also known as MCS USA) initials seem to stand for Marketing, Commerce and Service, the company was founded in 1990, it has either 4 or 10 employees and one or more of three addresses in that town, and either provides consulting and support like its name says or imports ‘durable goods’ presumably like this cow; but also that its largest import in the last year or so has been coffee from Brazil, which I believe is where its President comes from. Its web site no longer functions – so it remains somewhat of a mystery, at least to me. The finely done Holstein standing in the grass with flowers is impressed with E.E.G.G. 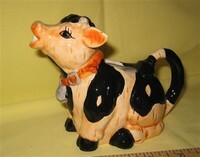 Ltd, and has a decal that reads “James Herriot’s Country Kitchen, 754048 Cow Creamer, Border Fine Arts Studio, © 1999 James Herriot, Made in Malaysia”. EEGG is the Enesco European Giftware Group, headquartered in Carlisle, Cumbria, UK, a subsidiary of Enesco of Itasca, Illinois, which has a large line of branded giftware and collectibles. Their products, under a number of brand names, are widely scattered through my collection. James Herriot, the pen name of James Alfred Wight, is a country veterinarian in England who’s perhaps best known for “All Creatures Great and Small.” Not surprisingly, there’s a James Herriot web page. 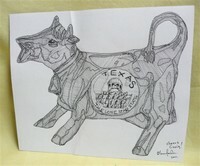 There are a couple more Border Fine Arts James Herriot creamers further down in this theme. 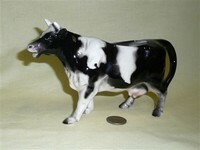 The Herriot cow’s companion in this picture, with the stand supporting its belly, is unmarked except for ‘6970’ on the right side of the base, which is hollow and connected through the legs to the body cavity; it came from the UK via eBay, so my assumption is that it is British or European. This lovely creamer is very definitely British. 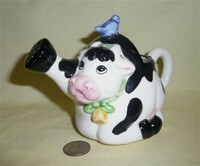 It is stamped “Fairmont & Main, Down on the Farm, “LULU” Creamer, hand decorated with love & care”. Their website, Fairmont.co.uk, states that “Fairmont & Main Limited was established in 1994 by Philip and Glennis Harrison with a commitment to offering our customers good quality tableware, greater value and excellent service. During the last twenty years we have done just that and in the process established ourselves as a trusted and well-respected tableware brand.” I naturally checked, and neither “Lulu” nor “Down on the Farm” are still on offer. This is a rather simple creamer that may not seem to deserve ‘stand-alone’ notoriety from all the other black and white ones, but what I find interesting is that the writing on the box, and on the inside care instructions, is in German, English, Dutch, and Czech. He/she (it’s rather sexless…) has a decal on the bottom that says TCM, and it was ‘Made exclusively for: Tchibo GmbH, Überseering 18, Hamburg’, but gives a UK website (it turns out that Tchibo has websites, for on-line shopping, in several European companies). Checking that out, I find that Tchibo started in 1949 as a mail order coffee company (that may explain why we found this cow in a coffee shop in the railroad station in Potsdam), but is now an international corporation whose product lines include “travel, mobile calling plans, financial services, fashion and technology.” Egad. Amazing what you can learn from a little cow, and equally amazing how companies change. Now, here’s an interesting interpretation – her legs are so short and splayed she’s standing on her teats. Rubber tipped of course. 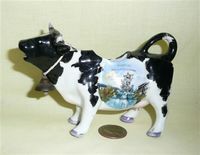 Her tag appropriately dubs her “Udderly Cow Creamer”; she was made in China, ©2005 for Boston Warehouse Trading Company. Their web site, www.bwtc.com, notes that they were founded by Peter Jenkins of Manchester, England, in 1974, initially distributing European products but creating their own housewares staring in 1980. If this creamer is any indication, they have weird ideas about cows in Boston. She’s not alone, however…check out her cousins on the ‘Sugar and Creamers’ page. 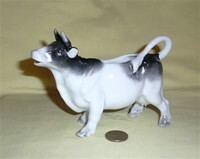 This cute ‘farm fresh’ creamer comes from Grassland Roads (“Gifts that Inspire”), a specialty gift division started in 1999 by Amscan, Inc, which was founded in 1947 and per its web site “is the largest designer, manufacturer, and distributor of decorated party goods and party accessories in the world”. Another unusual interpretation, wide and stocky. Apparently meant to be dearly loved however, from the heart-shaped spots. 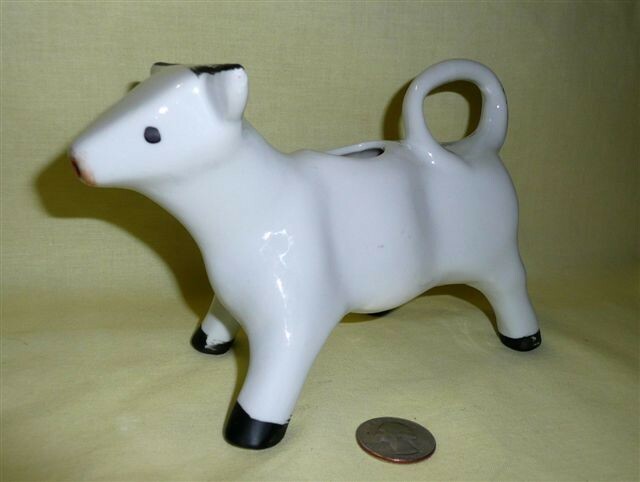 This is a nicely fashioned Holstein that bears a faded sticker from Brinn’s, Pittsburgh, PA, and was ‘Made in Japan’, I believe in the 1950’s, but for sure after the quality of their export ceramics had significantly improved after the war. From a couple of web sites…e.g. headvase museum and auction bytes – we learn that “Founded by Samuel I. Brinn in the early 50's, the Pittsburgh-based company stayed under the management of the Brinn family. In its beginnings, Brinn's was a wholesaler of art ware, dinnerware, figures, garden pottery, jardinières, premiums, teapots, glassware, ovenware, novelties and various ceramic and glass accessories. By 1959, the company distributed ceramic and brass imports from Japan and England. Two decades later, under the operation of president Charles Brinn and vice president David M. Brinn, the company was listed as in importer of ceramic figurines, animals, novelties, dinnerware, stainless steel, and dolls.” All kinds of ‘stuff’. This is just a nice simple unmarked interpretation – mostly black but with a dab of white and a very orange udder. This is a lovely little German porcelain creamer, which has lost a bit of its paint from careful use, with an old brass bell and a picture of “Stettin, Manzelbrunnen”. She could have just as easily fit in the Ads and Souveniers section. Here’s a companion piece, again German porcelain, a souvenir of Ostseebad GrossMöllen, Westliche Dunenpromenade. It’s marked for “Verkatattenarbalk” … whatever that is. I don’t quite know what to make of this one, but it’s delightful, with the lady with the pointy black cap and huge beer stein (do witches drink beer?) getting a ride. 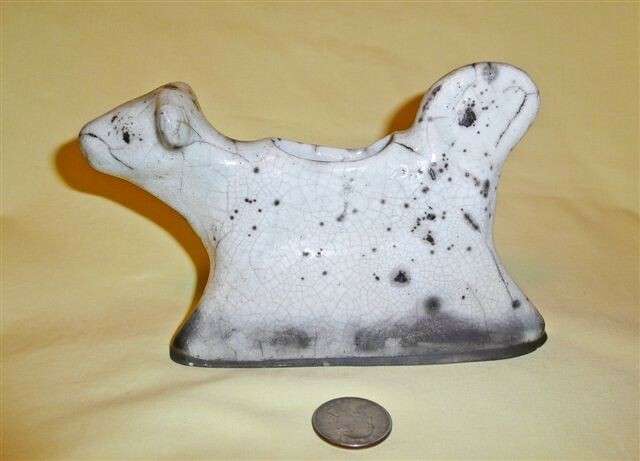 It’s porcelain but has cold paint, an unusual combination. The seller dated it to @1900, but didn’t provide any further information. 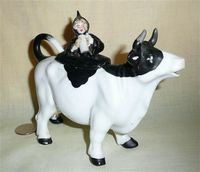 This creamer appears to be from the same mold as the cow the lady is riding. It’s nicely painted under its glaze, and is stamped with a double eagle crest and “Schwarzburg”, Wikipedia informs us that “The House of Schwarzburg was one of the oldest noble families of Thuringia, until its extinction in 1971 with the death of Prince Friedrich Günther.. Reigning over the County of Schwarzburg and founded by Sizzo I of Schwarzburg (died 1160), the family split in the 16th century into the lines of Schwarzburg-Sondershausen and Schwarzburg-Rudolstadt, which were not reunified until 1909.” What that has to do with either cows or witches is beyond me, but for those with an interest, there’s a whole lot of info about the House Laws of Schwarzburg in www.heraldica.org. 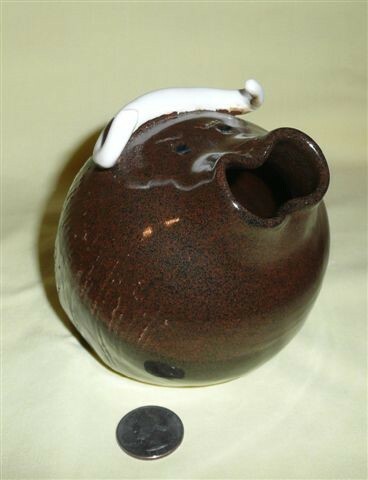 This rather large and rotund lidded creamer is also German, or so I was assured by the seller because it came from the estate of a German lady who had just moved into a nursing home, and apparently had only German items. 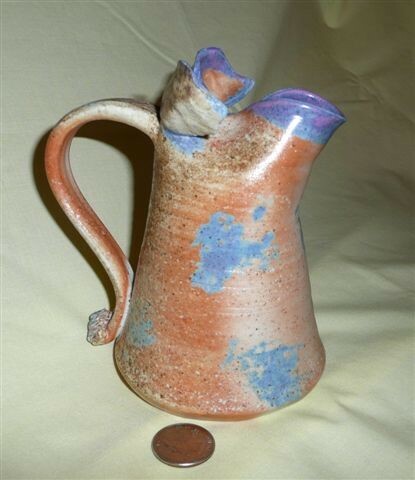 Here’s another intriguing one – hand made by the seller, Dottie Dracos of Oregon. 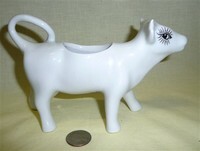 I’ve often wondered why more potters didn’t make cow creamers – this may be part of the answer. This is another interesting variant – hand painted if not home-made since it’s signed “LL Bell 2015”. 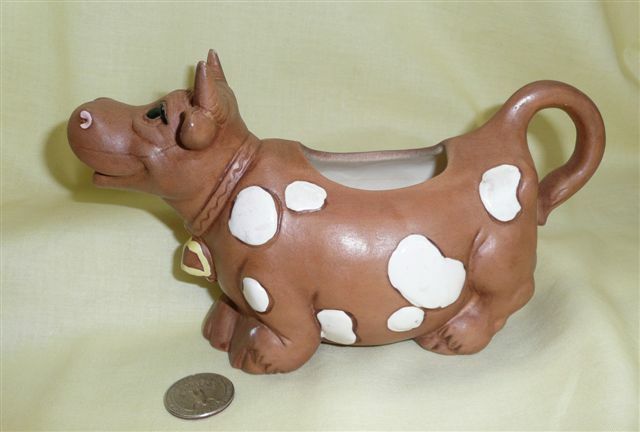 The unusual feature here is that this little cow has a hole on top of her head as well as the normal fill and pour holes. Ventilation? And finally for the black and white, here’s a rather large lidded creamer, with “DWS, Ojai CA” hand written on the bottom. There are also pure black cows, in addition to the Jackfield creamers. These are all made from heavy red clay, in Japan; the small one bears a green sticker with white lettering for “Ezvin”; I can find a couple pointers to other products from them via google, but no further information. Transitioning from black to brown, here are two beautifully molded, realistic large German porcelain creamers, with the number ‘3’ impressed on their bellies but no other markings. 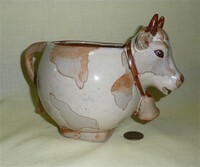 There are some similar to these but smaller in the German ‘herd’ in the Places theme, and a number of other fine German creamers on page three of this theme. I have never been able to identify the maker of most of these – somewhere there has to be an expert on German porcelain who could help…I hope. Brown cows come in a wide variety of tones and shading. This is an international herd, with representatives from the US, Japan, and Europe. Here are three small Japanese creamers (they almost made it into the miniatures theme), with the common characteristic of being filled below with grass and pink flowers. The one on the left is unmarked, and the one on the right simply says Made in Japan; but the little Niagara Falls souvenir has a key-hole shaped stamp for the Pioneer Mdse. Co, N.Y. I tried google and found that someone else had asked for information about them on yahoo, with no more information forthcoming. Occasionally I make an interesting ‘find’ when I least expect it. My wife and I stopped in Oxford, Maine to buy wool for her rug braiding, and in the back room of an antique shop across the street (my treat for bearing up with the wool buying) were these two old, sort of dirty, brown unglazed cow creamers. 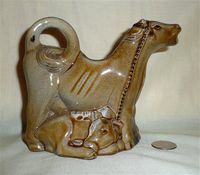 They looked familiar, and when I got home and could do some comparisons, it turns out that they are very similar in shape and expression (down to the curly tails) to this idiosyncratic early Japanese creamer (it is shown along with larger and smaller versions on the ‘Places’ page). I’m sure they have an interestinghistory…wish I knew what it was! No sooner did I buy the unglazed creamers shown above, that up on eBay came the little brown guy in this picture… same mold, but with a simple shiny brown glaze and red nostrils and lips. He’s shown here for comparison with two somewhat similar – but from very different molds - versions of the large Japanese curly-tail. Three unusual brown ones…the seller of the one with the big flat nose on the left indicated it was from “COUNTERPOINT”, San Francisco, and Made in Japan. The little one in the middle is also almost certainly from Japan. 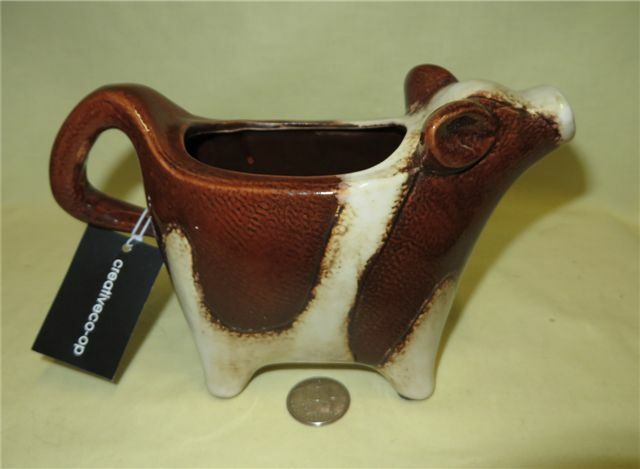 The strange little egg-shaped brown English cow on the right is unmarked, but I have seen an identical one (as well as a grey version) on offer that had “Rector’s Pottery” incised on its belly. I haven’t been able to find anything about them about except for their address, which is Greenway, Caulcott, Bicester OX25 4NF (which I found in an add for a property sale). Here is a better view of a pair of the small brown cows that are similar to the one in the middle above. Both of these have a bit of age to them – they also both came with previously broken but nicely repaired legs, and neither are marked. The dark brown one is from the UK and was said to be ‘rustic Victorian’. 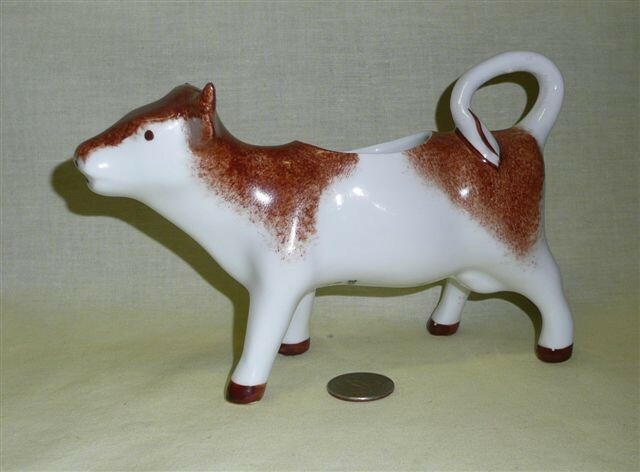 I think that may not be an inapt description since it does seem to be a relatively early version of the simple standing cow creamer that started to come into fashion in England about that time. 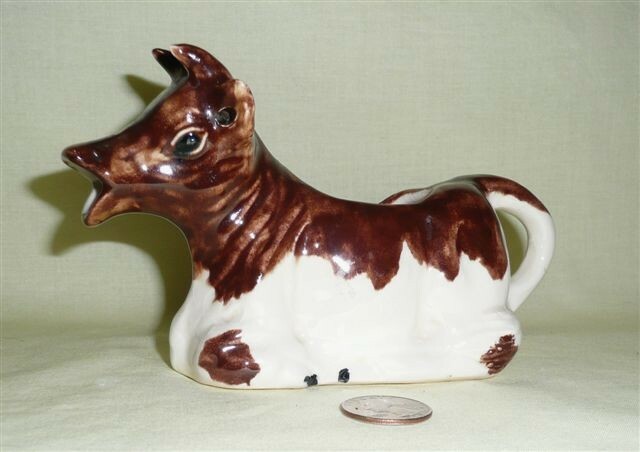 This rather forlorn looking large and sturdy brown and white cow with floppy ears, orange udder and blue eyes with prominent eyelashes arrived from NY with no indication of age or maker. 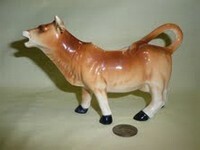 The sitting up calf with the buckle around its neck is copyrighted for Cracker Barrel, 1997. Those folks do make good breakfasts. 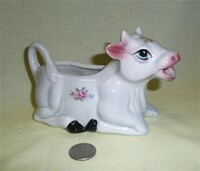 Its lazy neighbor with the googly eyes is from Home Essentials and Beyond’s ‘Happy Cow Collection’. This company, founded in 1992, sells glass and ceramics, etc through retail chain stores. This cute little caricature – sort of white with brown and black markings – has “Italy, 559/B” written on her belly. It came to me from the UK. There’s a bit of a story here. When I bought hthe little creamer on the right it came with a broken tail, so I contected the seller who - after a friendly exchange of emails - sent me another direct from Pataling Jaya, Selkangor, Malaysia. It has a squarish fill hole but no lid, and when I inquired I was told it didn’t have one. Well, some 7 ½ years later up pops the little guy on the left that’s quite similar albeit made with what I believe to be a different but quite similar mold. It does have a lid, but came to me from a much less exotic place – North Carolina. Here are two that are mottled brown and grey, with different surface heights for the two colors. The chap who sold me the one without legs must have though it was a tea light holder because he sent a couple candles along with it. The darker brown caricature with the big ears (and no horns or eyes) bears a tag for “Creative Co-Op Inc, Memphis TN 38141, Made in China”; their web site says they’re a wholesale to the trade design company founded around 2003, with the motto “Designed by us ~ Inspired by you”. I found this cow on Amazon’s web site. I guess those folks do indeed sell about anything these days! This is another quite large and heavy creamer, unmarked, that came to me from Ontario. I think she has a very guilty look on her face…maybe kicked over a lantern or something. You may have already met the big-uddered cow on the left – it’s a Goebel, and was featured in the Brands section. What’s interesting here are the other two, which are copies – the one in the middle from a very similar, though a bit cruder, mold; and the brown one with frosting somewhat smaller and with a few distinctive features like flat horns, but nonetheless a very close resemblance. The only one of these three that has any distinguishing mark is the one in the middle, and it’s stamped for Longlands Farm, Matamata, NZ. This pair with lids both came from the UK, although the feel of the porcelain is more German. The first one I bought was sold as ‘Victorian’, which is probably about right, and the one on the right retains faint remnants of the writing in its side, “Straught fra the cou”. The rest of these are also German – the large brown one has the incised “Germany 1498” on the lower belly, indicating that although it has no makers mark, it’s a colored version of the Gerold Porzellan white creamer described above (this didn’t occur to me until I was writing this, then I went and closely compared them and yes they are from the same mold, as is a grey and white one shown later on) and the ones in the grass are marked “3865, Germany”. 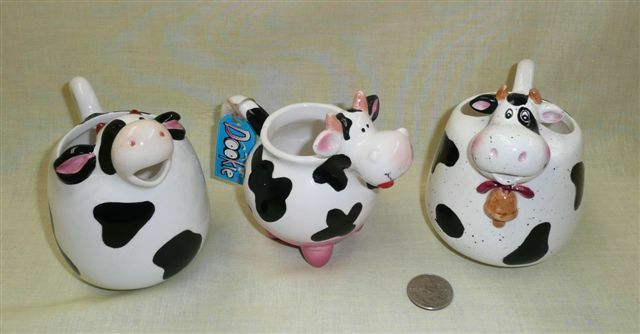 The one in the middle with the grass base is the #3864 in the same series…sold as a ‘cow creamer’ as many other animals are, this one’s a giraffe. Here’s three bulls – the one on the left by Norcrest (their #K393), made in Japan. The large middle one is also stamped for Japan, and I believe the brown one is from there also. This is a heavy ceramic bull caricature, made by Tommie Bond of the Lexington (MA) Arts and Crafts Society. She sold it as a ‘bank’, but I know better! Those puckered lips look primed for cream. This is a real German beauty. 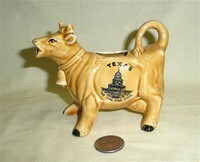 There is faint gilt writing on the front that translates as “From Hanover, Milk Cow”. It is signed on the bottom “Deposé, Germany, ges. Gesch. (abbreviation for gesetzlich geschützt, or registered design or patent), No. 3”. These two would appear to be from the same mold, but the one on the left is marked for Austria, and the one on the right for Germany. Perchance from the same factory at different periods of history? Two more unmarked browns, very different styles. Yet three more, ranging from fancy to funny. The realistic one on the left with the white head is fine porcelain from Seged Porcelllan, Bavaria. The middle dappled one is made in France and comes from Lamalle of NY City, which specializes in professional cookware (their stamp is gold and bears a picture of the Eiffel Tower). As I learned from corresponding with someone who sent me a question, identical ones were also sold by BIA Cordon Bleu (which started in 1952). The one on the right with the bumpy white paint bears no marks. This mottled brown caricature which came from Ontario (though I doubt it was made there) has two distinctive features – the uncomfortable large udder and, of all things, a small green fish inside, looking back out the fill hole. Somebody had a rather weird idea about cow chow (Icelandic horses eat fish, but I don’t know of any cows that do). Here’s one only a mother (or a crazy collector) could love – it’s hand made from very heavy clay and came from HandmadeHollows which is in Chicago. This one looked familiar when I went to buy it so I hesitated and did some checking – it turns out it’s a plain brown version of the white creamer with lots of decorations that’s about 6 sections down in Sugars and Creamers. Like its doppelganger it’s unmarked so I have no information about it. Three more, all unmarked but older and acquired from the UK. The light tan one with the red on ears, tail and lid knob is quite unusual in that it has a cork stopper on the lid. This delightful small creamer also came from the UK…unmarked but I’d guess 19c and from the continent from the style and the thickness of the base. It’s a lovely and unusual example of an early 1- person size creamer, and obviously very different from the English creamers in vogue at the time. There are a bunch of brown and cream ‘Jersey’ cows marked for the island in the Advertising section, but I thought I’d show these three – from very similar molds but distinctly different sizes – here. The larger and smaller ones are unmarked, but the middle one’s belly bears the impressed mark of an oval with “N.J.” inside; it also has the word JERSEY impressed, not just printed, on both sides. All three came from the UK. The seller of the middle one attributed it to Mervyn and Nelys Jude, but could offer no further help…a web search places a Nelys Jude in Oswestry, and a Mervyn Jude in Dereham…there may of course be others, or different dates, or… There is beer mug attributed to two folks by those names in the Auckland Museum, but the Kiwis date it to the 18c. Mervyn Jude is also noted as an English artist, apparently mostly painting horse races like the Grand National, judging from ones sold at auction in the 1970s. Per usual I’d enjoy hearing more info on this mysterious but talented couple. 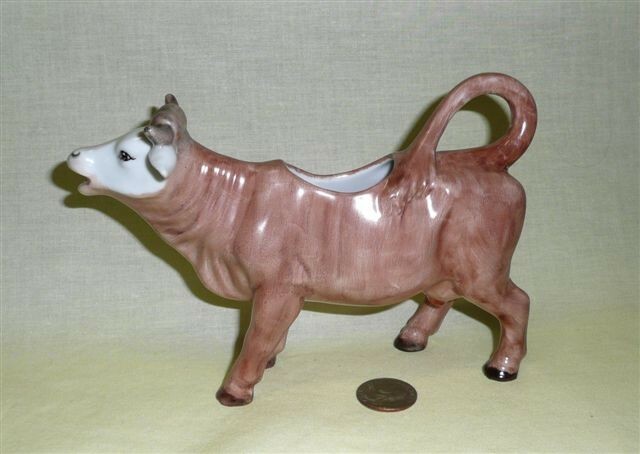 They did make a nice cow creamer. Meet Peppy the Cow. In some ways Peppy is a very ordinary, if nice, little cow. There’s a white version of her featuring Washington DC in the Advertising section, and I have other creamers like her – although not shown – from Michigan, Virginia, Houston, the Grand Ole Opry, and even Germany. She’s very popular for souvenirs, and appears frequently on eBay. In another way though Peppy is a very special little cow. Oli Fowler, a BA student in Graphic Design at Camberwell College of the Arts in London, picked her up at a charity shop in Walthamstow as part of a university project; the task was to buy and research a charity shop object that caught his eye, render it in drawings, paint, digital, etc, and tell its story past and future. As part of his research Oli came across this web page and that started a fun conversation…Oli probably learned more about cow creamers than he really wanted to know! So naturally enough when he put Peppy up on eBay to let her continue her travels, I had to acquire her. Oli was kind enough to include one of his many excellent drawings along with Peppy…they now form a proud and happy part of my collection. Peppy has indeed gotten around quite a bit, and it’s nice to know a bit of her history. I sure hope Oli got a good grade! These lovely little kneeling creamers are marked for Brad Keeler, mold #711. From http://california-pottery-index.com we learn that he “was born in Lincoln, where his father was a ceramic engineer for the local Gladding-McBean plant. After studying art at USC Keeler opened his own Glendale studio where he created naturalistic figures of birds and animals. These were air-brush decorated and enhanced with hand-painted details. Especially popular were the flamingo figures. In the mid-forties Keeler developed a brilliant red glaze which he called Ming Dragon Blood. This lead to the development of a successful line of Chinese Modern housewares...vases, ginger jars, low bowls, smoking sets and more. Business was good enough to build a new large factory on Delay Drive in Los Angeles. While Japanese were flooding the market in the early fifties, Keeler was still expanding, building an even larger factory in San Juan Capistrano in 1952. Tragically that same year, Keeler suffered a deadly heart attack. The company couldn't survive the loss and closed its doors in 1953.” The bidding on eBay went quite high for such small creamers, which is an indication that there must be quite a few Brad Keeler fans out there. 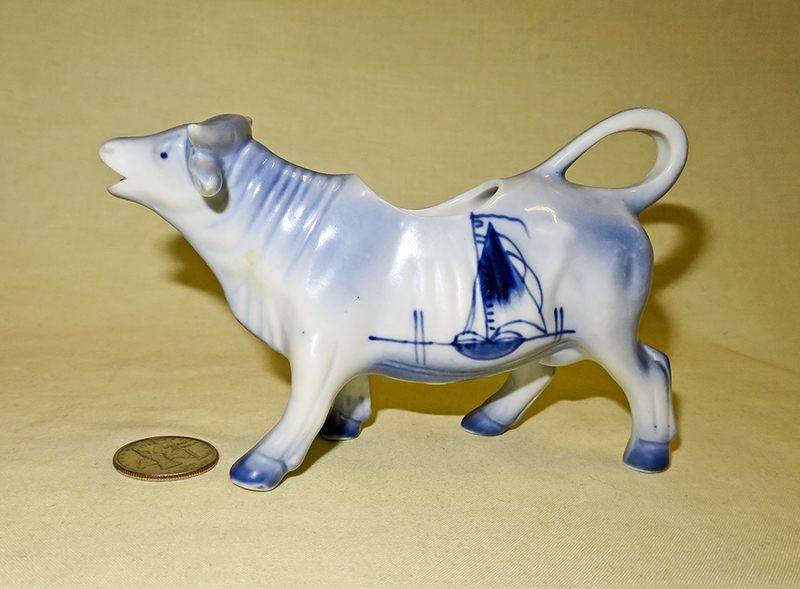 Finally for the browns, here are the front and back of an unusual rendition of a cow with both a milkmaid and a calf, from The Guernsey Pottery. Since it came from the UK I assume they mean the Channel Islands Gurensey, not Gurensey Ohio which also has several potteries. These guys are all Japanese, except for the one with black feet and yellow bell. These Japanese purple beauties all have raised flowers. The two standing up have the mold stamp “B876”, one in red and the other in green. 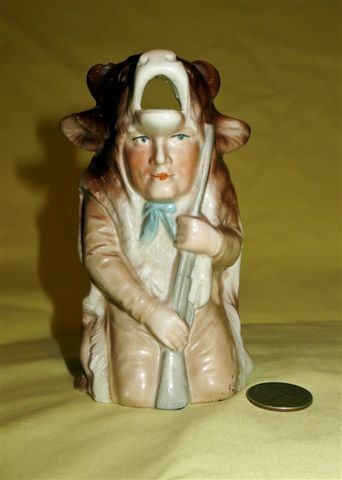 In the sugar and creamers page you can find about 3 different sets of these yellow-horned, bulbous nosed caricatures, which I believe are all from the Japanese maker Thames. 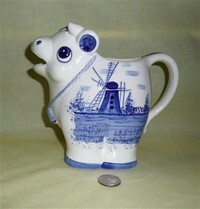 There’s also a Thames long skinny teapot, and a cow with six cups and a barrel on its back that’s on the Pitchers page. This one is unusual (actually they’re all unusual in a sort of weird way) in having a wooden stopper with cork in the fill hole on top of its head. It may not have been intended for cream, but the mouth is open so it’s for something that isn’t too volatile. This one came complete with angelic calf…not old enough to have two holes but I couldn’t bring myself to separate it from its mother. This is an inexpensive post-WWII Japanese creamer, accompanied by salt and pepper shakers . I assume a sugar bowl was lost or broken somewhere along the way. There are even a few blue creamers. The one on the left is a souvenir of Wildwood by the Sea, on the Boardwalk in Atlantic City, NJ; it was made in Japan for Arrow of Jersey City. The sugar and creamer in the middle are copyrighted for Otagiri, Japan. I’ve seen the dark blue one in a number of kitchen shops, and like the white ones, it’s from quite a few importers; this one is from HIC, Japan. This cow is from the same mold as the one on the left in the picture above – it‘s a souvenir of “Fabulous Las Vegas” and came as a birthday present from my son and daughter in law. 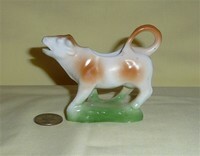 This is quite a popular mold for souvenir cows dating from the latter part of 20c. Now, this one if REALLY blue, and blue all over inside and out. It’s also a rather unusual caricature, but seems perfectly happy. It’s unmarked, but the seller said that it’s likely Dryden, and from a bit of searching it does seem to resemble their style. From the Encyclopedia of Arkansas History and Culture (or from Kansapedia of the Kansas Historical Society) we learn that “Dryden Pottery was founded in Kansas by A. James Dryden, who relocated his business to Hot Springs (Garland County) in 1956. Dryden Pottery has become collectible and has been listed in Schroeder’s Antique Guide for many years….” plus a whole lot more. My wife and I recently visited Hot Springs National Park, and can understand the attraction to a potter – both a good local source of clay and talc, and lots of potential customers from the myriads of folks who came to visit the hot springs. Sort of like the Brits did in the previous century – make nice but reasonably inexpensive things that folks would like for a souvenir of their vacation. Here is a lovely, small and fairly modern English lidded creamer, the only one of its type I have seen. It has an impressed mark for “Cheddar Pottery” as well as a triangular sticker with a tower on a hill over script “Carefully made in Somerset England”. It turns out that Cheddar Pottery is a Grade II listed Building on Cufic Lane, Cheddar, Somerset - “Two cottages, now pottery and shop. Early C19”, according to its listing. The town has a web site, www.cheddarvillage.org.uk, that notes that its distinguishing feature is Britain’s largest gorge. Even more fascinating to me however is the following: “The global origin of the word Cheddar comes from over a thousand years ago when the English village was originally referred to as “che-dwr”, a combination of English and Gaelic terms which became the “Cheddar” village name we know today. If domain names had existed back then, cheddar.org would have rightly belonged to the village elders (nowadays it’s being cyber-squatted by a domain re-sale agent, but that’s another story)…The cheese made using the process which originated here is the second meaning of the word. And in modern slang the word “cheddar” can also mean money or wealth, and also a way of scoring a goal in football. There is also a mobile productivity “app” called Cheddar, and there is a popular word game called “Cheddar Gorge”. Quite a nice etymology lesson from this tiny cow. This is another unusual one, pretty obviously one of a kind, and handmade from very heavy clay. The seller claimed it was Amnerica19c folk art, and indeed it may well be. It is certainly unique, and nicely molded, painted and glazed. Here are a couple with blue shading. The one with the brown tail tip bears the sticker of Globat Art, and was made in Japan. The one with the pink rose garland and a smile is unmarked. 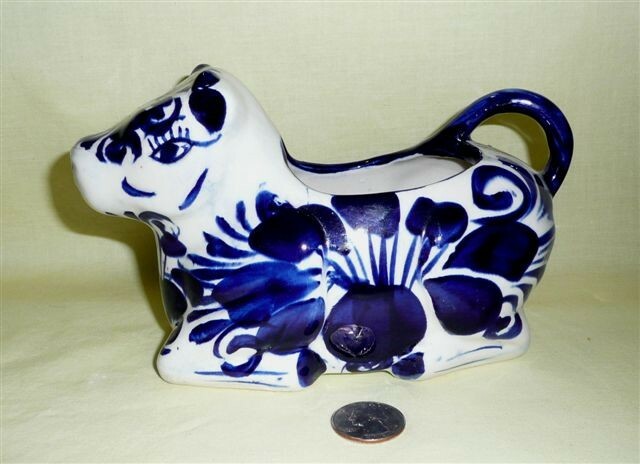 Touches of blue, in addition to the pink nose and flowers, qualifies this creamer to be here – it’s marked for Ceramica Primavera S.A. – there’s a company by that name in Juarez, Mexico, but the web provides only an address. 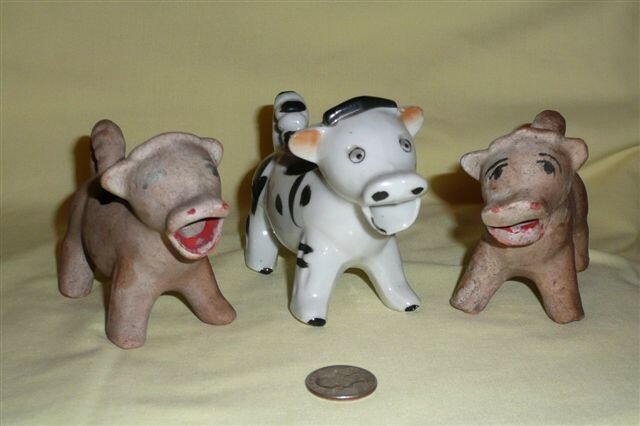 Three more: a rather odd caricature of a cow with a Dutch windmill design from Taiwan, an unmarked one with a very large head and primitive flower design of some sort, and a rather cute smiling cow, unmarked but decorated with flowers, with its horns and ears melded. This is “Blue Bliss”, © Susan Winget for Cracker Barrel Old Country Stores, Made naturally enough in China. 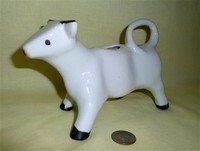 This is ‘Ditsy Cow’ from Sur la Table of Brownsburg, IN. Why 2? Well, I ordered one and forgot about it, then ordered another when it went on sale. They also have a plain white one, but I opted for the version with little blue flowers (both times). Hard to know where to put this one, but in spite of its typical ‘Staffordshire’ shape it doesn’t appear to have much age so I decided to let its blue flowers dictate. I actually bought it just for the humor of the lid, which is obviously a replacement – someone had a lot of fun adding the rather large and fierce fly.